For now let's talk about skincare. This maybe one topic that I would not mind talking over and over. I have been a fan of Korea novelas since Jewel in the Palace days more than a decade ago now. Are you? Since then I started to noticed how beautiful their skin were and already became a fan. From then on I've started to research, tried and patronize their skincare line who's result doesn't disappoint over time. If there is a specific area that I've been linient to take care of over the years is the eye area. This is where aging first shows, right? Like fine to deep lines, under eye bags and circles and forget not to mention crows feet in the future. Sometimes taking care of the skin focus on the face and ignore the eyes. These two should go hand in hand if you want to see ultimate young looking result, the most in the future. 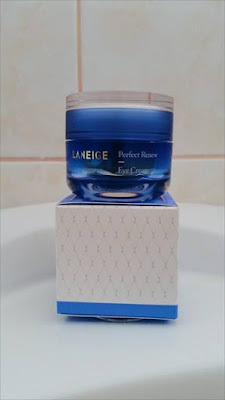 Last year, I was looking for a new intensive eye cream line to try, I've picked up the Laneige Perfect Renew Eye Cream, an Amore Pacific brand from Korea known for producing luxury skincare line. At 40 applying eye cream become a part of a routine but as you age, there is a right skincare to correctly combat your concern. 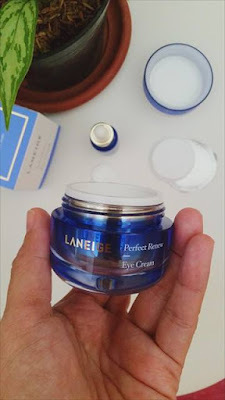 There's a different eye cream for one specific needs and my concern now is to prevent my upper eye lid from drooping, to firm up and plump the area. Under eye bags and circles is a minor concern for me and thankful for a slice of cold cucumber that's been a therapy at night if i want a soothing relief, best to do before bedtime. 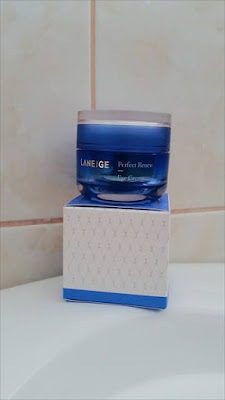 Now back to Perfect Renew Eye Cream, this is my second pot from Laneige. Though the packaging now is different from my last purchase but the result is just the same for me. Packaging wise, the color is cool and pretty that felt like I stepped into the sea for it's deep turquoise blue color. Maybe the concept derives from the ingredients which is the marine algae and ceramide. 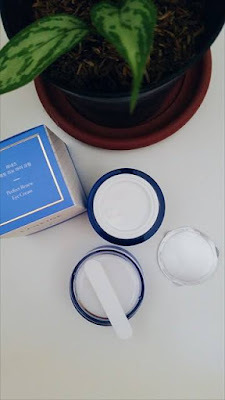 After I emptied the first pot, been more curious to try skincare line with marine ingredients and see if the result is different or would just be the same. Added that I am pleased with the new packaging since the pot is easier to open now not like before that my excitement fade off due to it's hard lid opening. 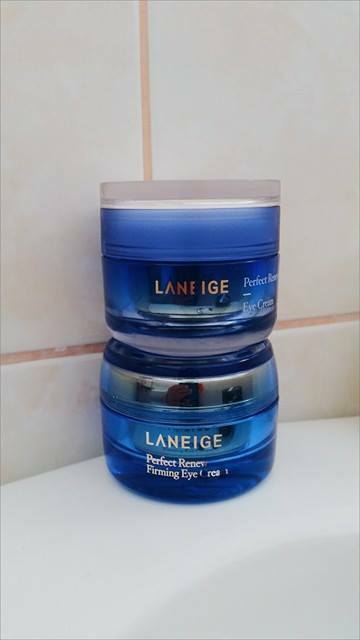 Due to warm tropical climate where I live in i love products that have a gel type finish. 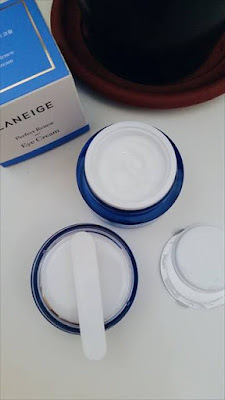 With this one, at first it's like a cream but when applied, it looks like a gel, easily to blend and immediately absorb by the skin so applying eye make up would not be a problem at all. It has a very light scent that can be considered none if you are use to heavy scented products. This is a big factor for those who have sensitive skin and can't stand strong smell like I do. Over all I love how it hydrates, firms, plumps and lighten the lines and show visible results in just five days base on my usage. And also felt like I have a good night sleep when I wake up in the morning. I consider this as a luxury beauty due to it's price range and base on my budget but the result is totally worth the splurge. The pot contain 20 ml and price as php 2,450 ($ 45-50). A bit pricey but the 5 ml is a bonus considering eye cream usually size up as 15 ml only. 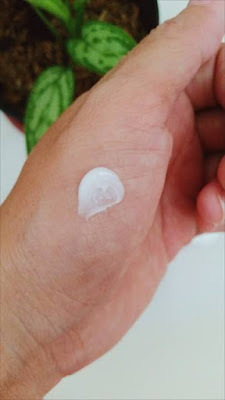 It lasted about five months on me applied twice a day, morning and at night and good for all skin types. I can say it's highly recommended and a must have! Most especially if you are looking for a skincare product with an immediate results. 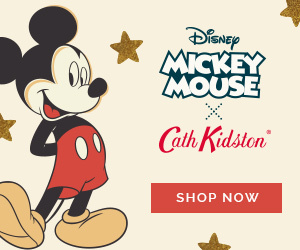 Did you ever tried this product? What's your thought about it? I bought mine in Laneige local store and you can get yours here in the US.